China Gears Up to Retaliate Against US Tariffs - Integration Through Media ....! (VOA): China is gearing up to retaliate in response to stiff U.S. tariffs on steel and aluminum as Chinese industry associations urge authorities to take “resolute measures.” Retaliation from Beijing could contribute to a possible trade war between the world's two biggest economies, analysts said. China's Ministry of Commerce has pledged to “firmly defend its legitimate rights and interests” and called for an end to the measures as quickly as possible. While the possibility of retaliating over steel and hitting agricultural imports and other sectors has been mentioned previously, it was the first time that coal has been drawn into the brewing spat. China's increased imports of coal over the past year have given the U.S. industry a needed boost. The group also said U.S. President Donald Trump's decision to impose 25 percent tariffs on steel would impact the global industry and be met with opposition from more countries. The U.S. has already taken other actions impacting Chinese exports of aluminum, solar panels and washing machines in recent months. The Trump administration has asked China to reduce the trade deficit by $100 billion and threatened several actions to force Beijing to listen. In 2017, the trade gap between the two countries stood at $375 billion; but, there are early indications that the deficit might be much higher this year. In January, the monthly trade deficit with China surged 16.7 percent, to $36 billion, its highest level since September 2015. Chinese Foreign Minister Wang Yi acknowledged growing concerns about a trade war, while indicating that Beijing was working on possible retaliatory actions. The stakes are high for both sides, but there are limits to the amount of damage they can inflict without hurting their own economies, analysts note. China has already launched a probe into imports of U.S. sorghum, a grain used in animal feed and liquor. There are two other flashpoints on the horizon — an upcoming report on whether China deserves blame for the large-scale theft of intellectual property rights, and a decision on the issue of dubbing Beijing as a currency manipulator. “They will retaliate; they've already signaled following Trump's steel tariffs [announcement] last week that they are going to take some measures. I think it is just a question of what they are going to decide to do,” Gareth Leather, a senior Asia economist with Capital Economics, told VOA while discussing the Chinese leadership's plans going forward. He said Beijing is clever and will likely target sectors of the economy in a manner that hurts the administration at a political level, he said. Following the announcement, the communist party-backed Global Times said in an editorial that Beijing should show it will not be cowed. “It [China] must retaliate against U.S. tariffs that forcibly interfere with Sino-U.S. trade and violate World Trade Organization rules. China must show it won't be bullied,” the editorial said. Beijing is expected to target soybeans, one of the most valuable U.S. exports to China. China has also used its purchase of Boeing aircraft as a bargaining chip in trade negotiations in the past and might now threaten to shift its preference to Airbus. Leather said China is also closely studying the coming U.S. midterm elections to fine-tune its attack if that is necessary. “I suspect what they'll do is they'll look at plants in certain swing states that may be suffering but have Republican congressmen up for elections and probably target those,” he said. While the Trump administration's measures go into effect in about two weeks, they alone will not have a major impact on the Chinese economy. For now, China's response is likely to be quite symbolic, Leather said, and the Chinese are not likely to ratchet up the pressure too much. “I think the risk is, however, that if the U.S. does press ahead on further protectionist measures, which do specifically target China, then, I think, China will have to respond in a much more aggressive way, and then obviously risks all end up getting a lot worse,” he said. Trade is not the only area that could be a factor going forward. 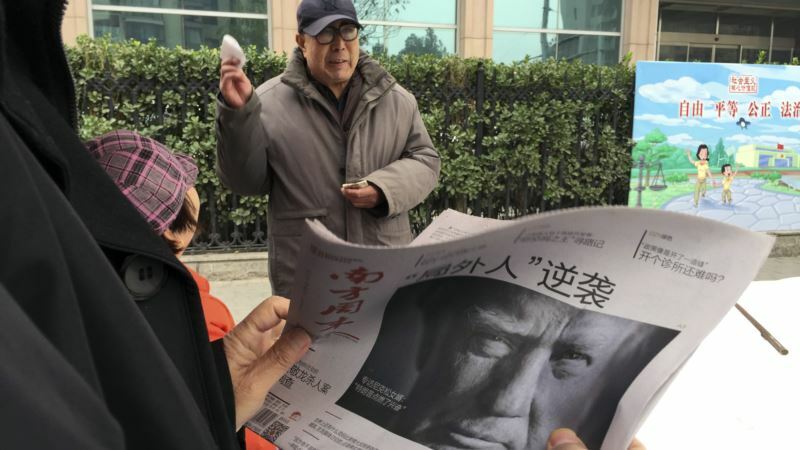 In a daily newsletter, Trivium China, a research group in Beijing, said news that Trump is expected to meet with North Korean leader Kim Jong Un soon [to discuss ending the North's nuclear program] could have an impact as well. “If Xi Jinping helps to facilitate that meeting, it might buy China some time; but, it would only be a temporary reprieve from Trump's trade ire,” the newsletter noted.